On August19, at the Okinawa Prefectural Government in Naha City, religious groups announced, "The Joint Objection Statement against Security-Related Laws." On August 19, Christians, Buddhists, Kaminchu or Okinawan shaman and other religious people in Okinawa announced a joint statement against new security laws. “The Joint Objection Statement against Security-Related Laws” has been supported by three hundred thirty-four people so far. The statement was addressed and sent to Prime Minister Shinzo Abe and the Head of Councilors Chairman Masaaki Yamazaki. It is the first time those religious parties in Okinawa have united　beyond their religious affiliations for the abolition of the bills. The statement mentioned the Battle of Okinawa and their regret that “religious people, who should have cared for the dignity of human life, supported the war.” The statement stressed the groups’ opposition to the bills. It says, 1) the forcible passage of the bills is the same tactic as forcing through the new base construction at Henoko; 2) the bills go against the Constitution. 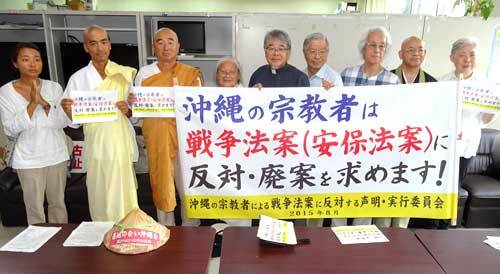 Advocates also include Protestant Christians and Buddhists from Shingonshu Gokokuji. For further details, call the executive committee at 098 (852) 3533.